Folklore has claimed that the world's first pencil was made in Keswick in Elizabethan times, following the discovery of a uniquely pure graphite deposit near Seathwaite in Borrowdale. Dr Tom Smith tells the story of the pioneers and characters who built a local manufacturing industry and a proud heritage, from the very early days of the handmade pencil to the mass-produced article of today. In 1853 the pencil factory of Messrs Banks, Son and Co., in Keswick was making between five and six million pencils a year. To that purpose the factory was importing six thousand cubic feet of cedar logs from South America. A London journalist visited the factory and gave a detailed description of the process: "The eye is confused by the machinery in action, and the bands and the spindles by which motion is given to the several parts; the ear is filled with the hum and the skurr of the saws." The men in the factory wore blue smocks. The men and the machinery looked as though "they had been fresh polished every morning". Joseph Banks, the senior partner in "the most extensive black lead pencil manufacturers in the kingdom" died in 1860 at the age of 53. The black wad or graphite which was the basis of the industry had first been discovered in Borrowdale in the sixteenth century. The story runs that "a large ash, or oak, tree was uprooted in a fierce storm on the approach to Grey Knotts from Seathwaite. A glistening black substance was found clinging to its roots. The locals called it wad." It was, in fact, the purest form of graphite found anywhere in the world. According to the seventeenth century geologist, Thomas Robinson from Ousby, it had a remarkable number of uses from easing the pain "of gravel, Stone and Stangury" to marking sheep and glazing and "hardening crucibles and other vessels". Its most important use, however, was "for rubbing on guns, pistols and the like" to preserve them from rusting. This made the wad a particularly valuable commodity. The mine was placed under the closest protection and it was transported under a secure guard to London. The first pencils were wrapped in string, paper or animal skin. In 1683, it was said that: "Painters drew their preliminary sketches with it, surgeons used this 'black-lead' medicinally, while writers rejoiced in this new instrument that freed them from having to carry a bottle of ink." The first pencil maker in Keswick whose name has been handed down to us is John Ladyman of Ladyman's Yard. When he died in 1811 at the age of 73, he was described as "an eminent pencil maker". A descendant, born in 1812, was Samuel Ladyman. He was known as a "Jack of all trades and master of them all". He ran the family business between 1840 and 1850 before moving on to the wine trade. He was very well respected in Keswick as a philanthropist and a benefactor of the town. In 1861, having worked for Joseph Banks, Robert Wilson set up his own pencil business in Greta Bridge Mill. In 1894 Hogarth and Hayes bought the Banks pencil firm. The pencil industry was thriving, but Viscount Lowther, M.P. 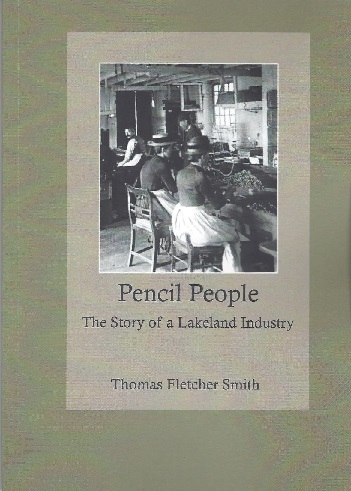 for Penrith, described Keswick pencil-making in Parliament as "a useful but decaying local industry". Hogarth and Hayes responded vigorously with the statement that: "We contend that the Borrowdale lead mines are not exhausted; that foreign as well as native plumbago has been used longer than our own personal experience of over 30 years; that cedar has always been imported; and that there is no decay in the Keswick pencil trade." The trade did decline. After 1920 the Cumberland Pencil Company was sold to British Pens Ltd., then to Twinlock and subsequently to Cumberland Graphics until it became part of Rexel in 1980 and then American Brands the year after. Today it belongs to Acco Brands and has been rehoused in a purpose built factory in Workington. Dr Tom Smith has written a useful, well-researched and detailed history of a unique Cumberland industry. It is a story which has been waiting to be told.